It's that time of year again. A shrimp boil...the Perfect Party! It’s always a hit with my because it’s casual, feels like a celebration of summer and you get to eat with your fingers! Hello?? ?...fun aaaaaand no dishes!! I got this one from my Dad (the recipe AND the cool bucket pictured above...luv). 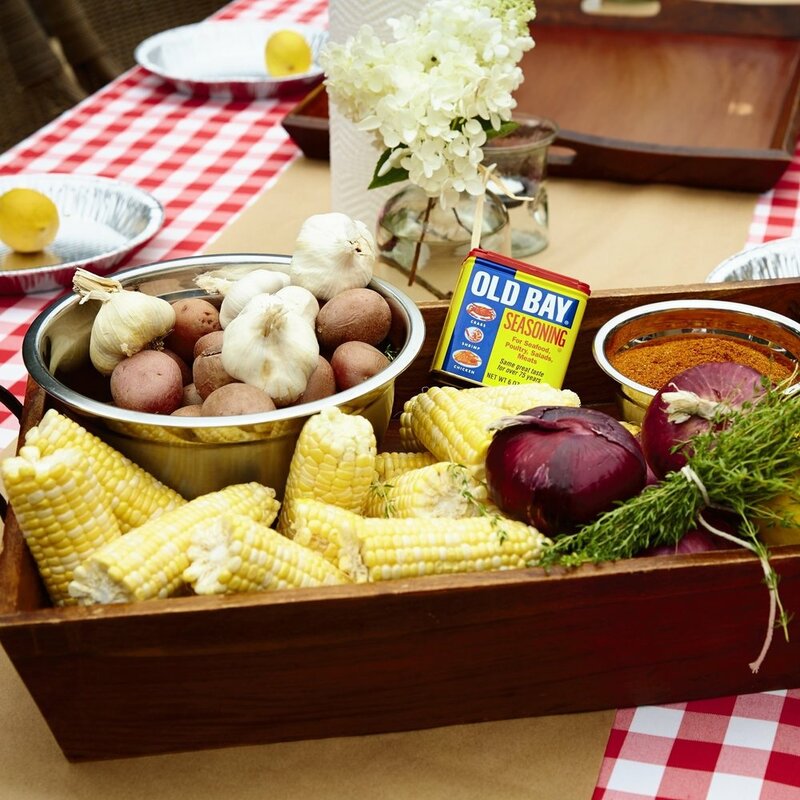 During the summers, in Virginia, it was always a BIG day when he brought out the shrimp boil pot! My sisters and I got so excited because we knew a fun party was about to go down. My dad went all out on food and festivities… I remember everyone smiling, laughing, eating, drinking and dancing all night long. Super easy, start by setting a beautiful table—effortless, pretty and summery. I use a red and white check tablecloth, then I lay brown kraft paper or newspaper down the center of the table. Then I use pie tins for plates and a lemon for a place card. Super simple and simply beautiful! Then, when you're ready to eat...just follow my 5-step guide....and throw all the goodness into the pool! I set a timer, sip a beer and get ready to feast! It's all just so much fun. My dad went all out on food and festivities… I remember everyone smiling, laughing, eating, drinking and dancing all night long. And I guess I just love to do the same. There’s no food that brings people together quite like a shrimp boil. Just roll up your sleeves, grab a cold one, and enjoy your fingertips full of flavor! Are you ready to put together your own shrimp boil in 5 easy steps? Click below for your free step by step guide. Cheers!